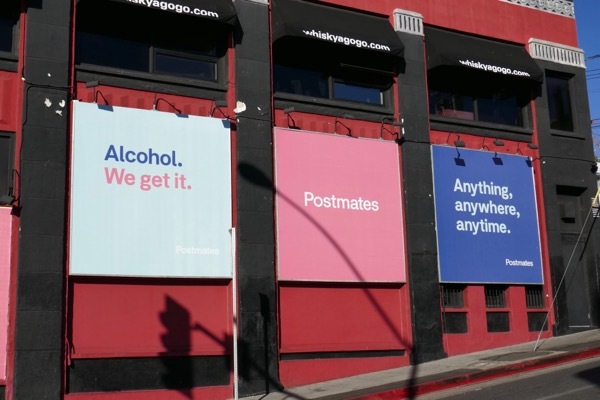 In recent years new technology and smartphone apps have made it even easier to get food and drink delivered in L.A., whether it be services like Grubhub, DoorDash, Eat 24, LA Bite, and more recently Postmates. 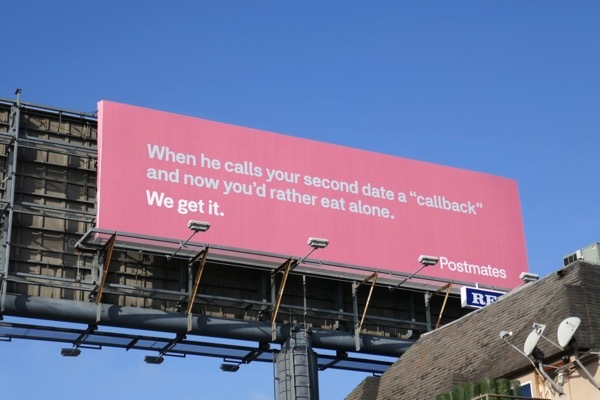 In the autumn of 2016 the on-demand delivery startup got some big financial investment, so it's no surprise that Postmates has taken over the skies with a colourful, humorous and timely billboard campaign at the start of 2018. 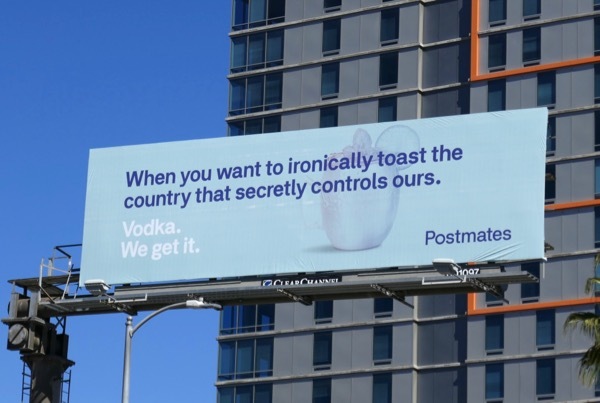 Whether it be delivering brownies when you've got the munchies, or fetching vodka to ironically toast the Russians that fixed the last U.S. presidential election (and continues to exert its bizarre influence over the current administration), Postmates tongue-in-cheek outdoor campaign puts a smile on your face and some yummy food in your bellies. 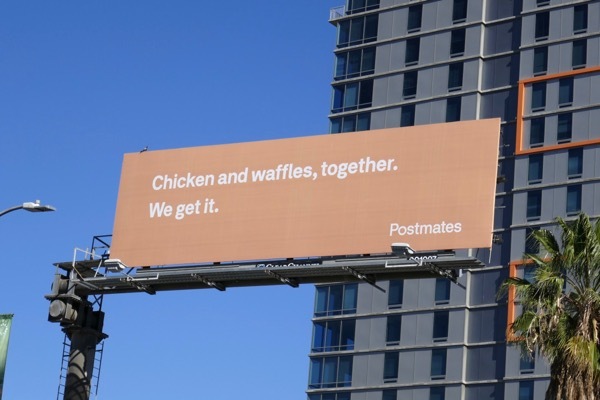 In fact, whatever your reason to order in, or whatever your preference for takeout, be it sushi, tacos, desserts, or chicken and waffles, they've apparently got it covered with their fleet of drivers delivering to your door. 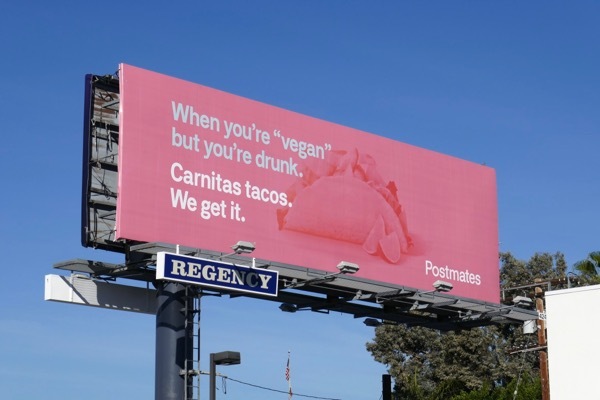 This fun Postmates 'We get it' outdoor ad campaign was spied around the streets of L.A., including in multiple billboard locations along Sunset Boulevard and Melrose Avenue, from January 24 to March 12, 2018. 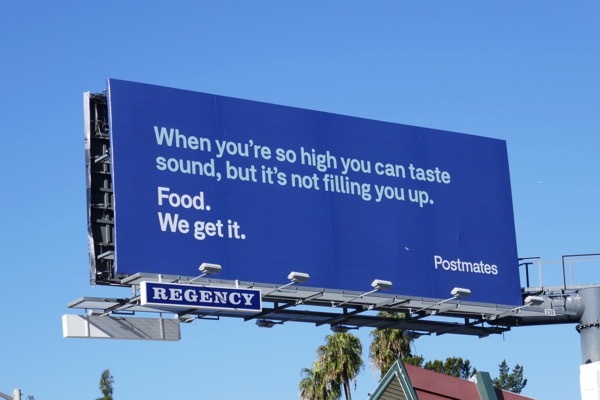 You can also check out these previous Postmates text emoji billboards from 2016 and more food delivery billboards to compare how their competitors approach their outdoor advertising. 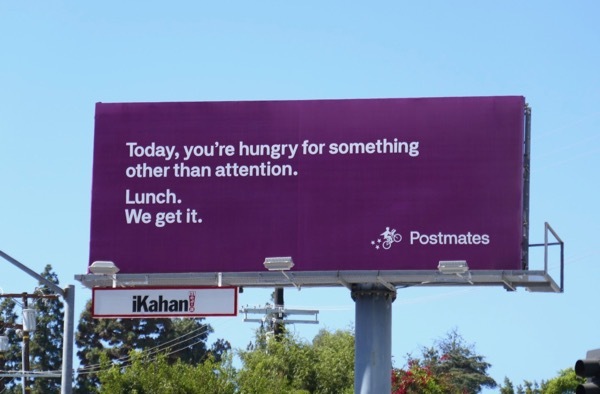 Feeling hungry or thirsty yet? 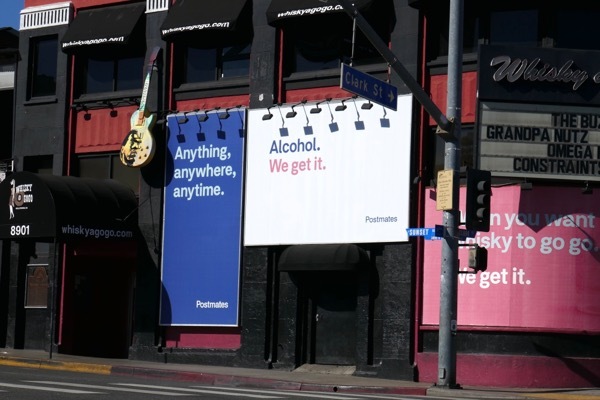 You know what, we know someone who'll get it for you. 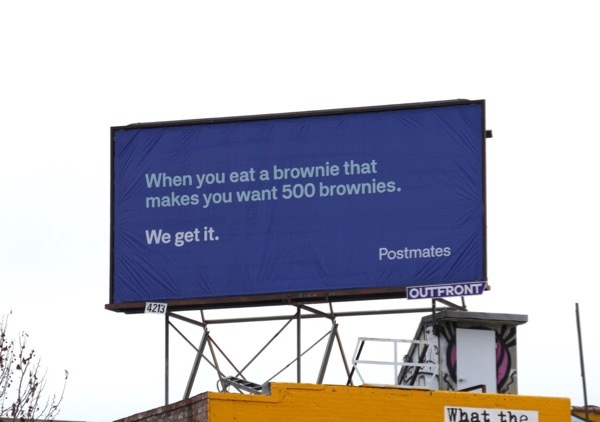 Now that's a real mate. 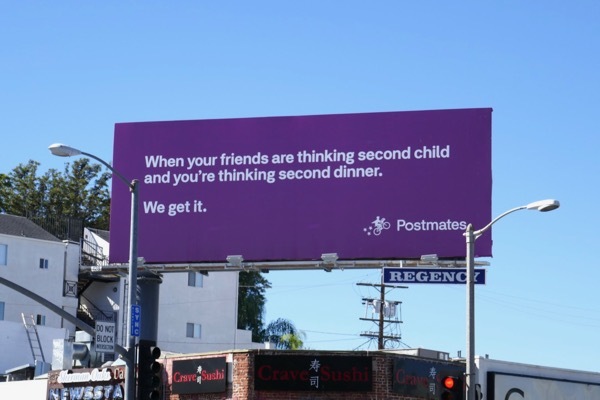 UPDATED: Postmates are back in the skies this fall and delivering more fun billboard creatives and including their very Spielbergian logo on them too (you don't think it looks like the Amblin logo?). 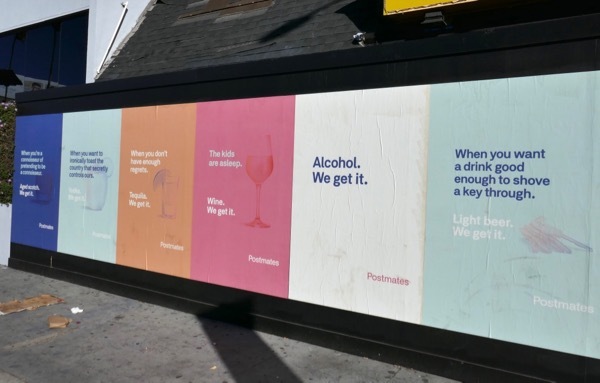 These 'We get it' ad examples were snapped along the Sunset Strip and Ventura Boulevard from October 2 to October 18, 2018.